Summer is here! The kids are done with school and we are ready for some lazier days and playing out in the sunshine. 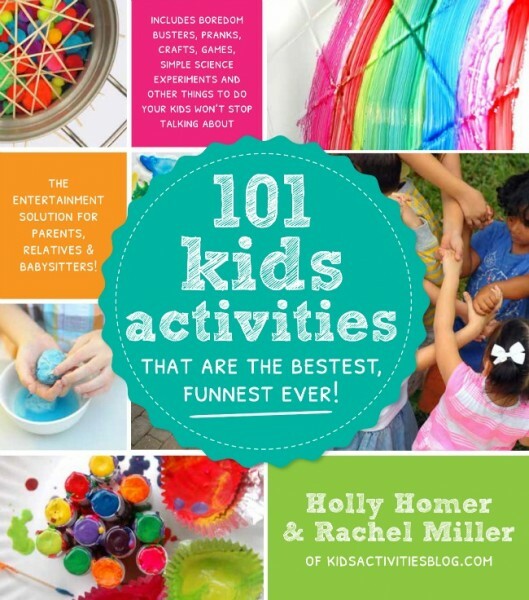 Holly Homer and Rachel Miller from Kids Activities Blog sent us their new book, 101 Kids Activities That Are the Bestest, Funnest Ever!, (affiliate link) and we have been having so much fun trying out their activities! 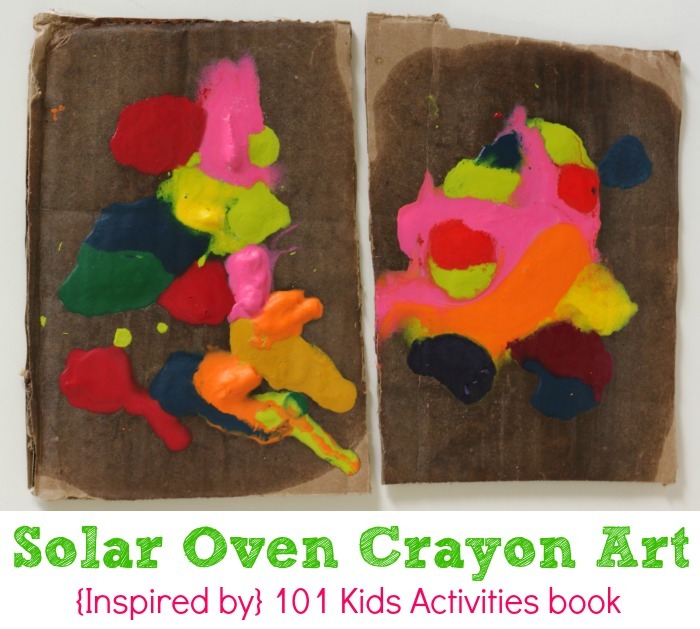 One of our favorites so far has been their Solar Oven Crayon Art! Cover the box with tinfoil and place the cardboard pieces inside. 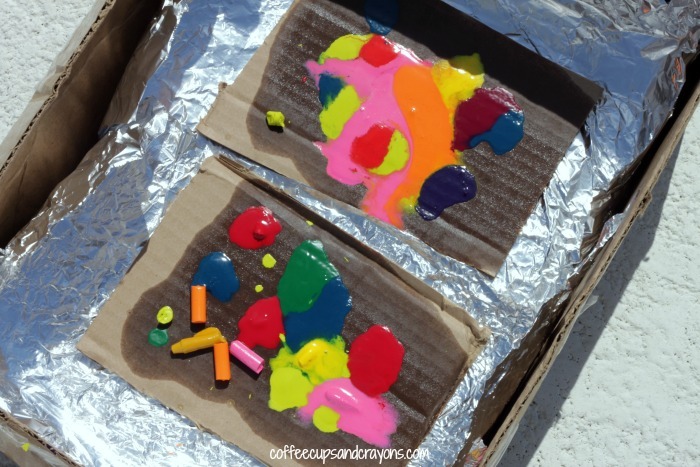 Then let your kids create a design with the crayon bits on the cardboard pieces. 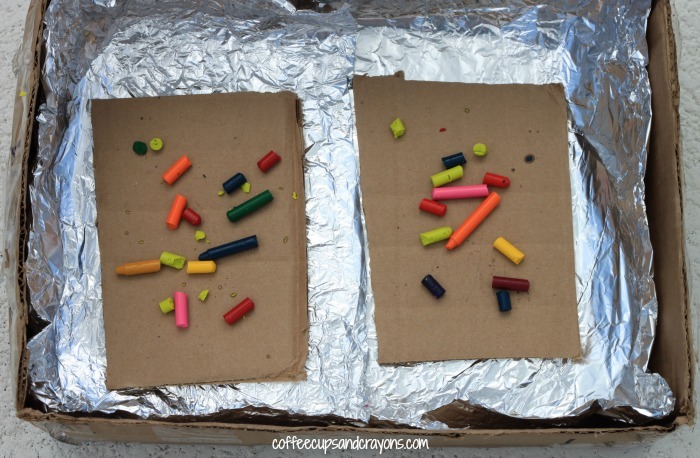 We experimented with different sizes and shapes of crayon pieces to see how they would melt differently. We made ours on a hot and sunny day so it didn’t take long to observe some changes. 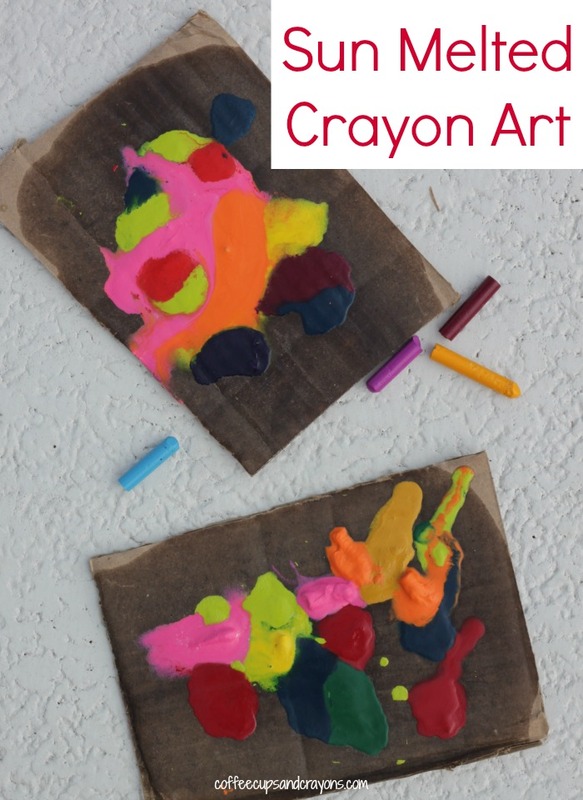 Within 15 minutes you could start to see the crayons start to melt and after an hour all of it had melted. The kids were so amazed to see that is really worked so quickly–and loved the end result! They talked about what which and sizes they want to try next time and have decided it would be cool to see what would happen if we used crayon shavings instead of pieces. More art and science out in the sunshine? Oh yeah! Holly and Rachel sent us a copy of their book a couple weeks ago to say we are in love with it is an understatement! The kids love to look through to see which activity they want to try next and I love to hear them chatting with each other about playing and learning together. The activities in the book are all easy and engaging and packed full of family fun! A huge reason this book has been out everyday is that we can all do them together. There are tips to modify each activity for older and younger kids in the book but even without using those everyone can play and have fun together which to me makes it worth its weight in gold. If you are want to check it out you can find copies at your local bookstore or online at Amazon (affiliate link). Disclosure: I received a free copy of 101 Kids Activities but they in no other way sponsored this post–in fact I’ve already ordered more copies on my own for my friends. All opinions are mine (and my kids!) alone. Thank you SO much for writing about the book!!! Love how your art turned out! It’s totally addicting! We’ve been making tons! My childhood playmate and I used to do this on her dad’s old El Camino hood. We would let the lump of crayons melt together for a few hours on the hot metal, then pick up the whole hot globby mess and molded it into a ball. After a little while it hardened and we colored with our new “crayon.” I always thought that was the coolest thing. Of course at 5 years old everything is new. That is so fun! I wonder if it would still work?